Office 365: Transición de Office 365 Video a Microsoft Stream! As part of our commitment to transition customers from Office 365 Video to Microsoft Stream, we are excited to announce that the ability to opt-in to migrate to Stream will start to rollout in Q1 2019. This rollout will exclude GCC. This message is associated with Microsoft 365 Roadmap ID 44019. 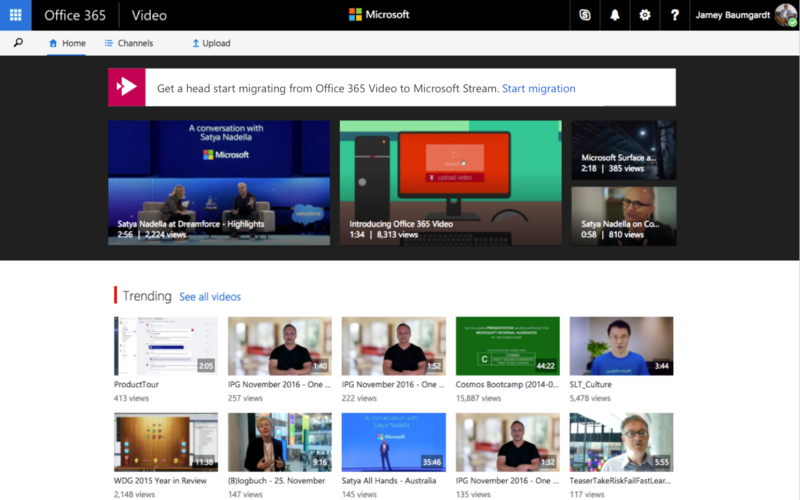 When your tenant is eligible for migration to Stream, Office 365 Video admins will see a banner in the Office 365 Video homepage prompting initiation of the migration wizard. The self-service wizard will guide you through the migration process when you opt in. During this process, we will migrate all your videos, channels and permissions to Microsoft Stream. When your tenant is eligible, you can opt in for migration. Please note that once you have started the migration wizard, the process cannot be paused and restarted later. If you are not interested in migration to Microsoft Stream at this point, no action is required. Please review the Additional Information for detailed migration steps.